If the era of accountability and transparency ushered in by the involvement of stakeholders in Sierra Leone’s destiny must be given impetus, the present SLPP government led by President Ahmad Tejan Kabbah must not be allowed to exit power without giving an account of their stewardship to the nation.. There are too many rumours, speculations and accusations floating everywhere at home and abroad of rampant and wide-scale corruption, misappropriation of public funds and fleecing the nation dry by ministers and other public functionaries in the Kabbah government . Sierra Leoneans have made no secret of their belief that this is one of the most corrupt governments to have ever graced the country’s political landscape . In their disgust and anger, Sierra Leoneans, led by their musicians , have coined new names for their political leaders whom they accuse of ransacking the national treasury and leaving the nation high and dry. According to our reporters and insiders based in Sierra Leone who provide us news, public disgruntlement has reached such levels that whenever a minister or top official of government parks his Pajero, BMW or Mercedez Benz anywhere , the words “Sewhgbeh”, “Borbor Belleh” and “Two-foot arata ” are used to describe him by frustrated bystanders One official was so upfront about it that he told LEONENET that whenever he went out, he was careful about where he parked his Toyota Land Cruiser. Sierra Leoneans believe that millions of dollars meant to develop their nation have found their way into private pockets or foreign banks. Speculation is also rife that mansions bright and grandiose have been bought or built by government officials abroad and in the country. There is even talk that President Kabbah himself has built retirement mansions in neighbouring Guinea. Such rumours and speculations are not good for our country. Apart from creating a climate of distrust and frustration with the political bourgeoisie , they have the potential of discouraging the people from participating in national politics when the public believes that whoever they vote in will eventually turn out to be a thief or two-footed rat . These rumours and speculation could also damage the country’s standing with international donor agencies and other stakeholders who continue to insist on financial probity , honest and democratic governance and a commitment towards the eradication of corruption. These rumours and speculations could well be untrue but given the ruthless manner past governments robbed the Sierra Leonean people blind, nobody is buying the government’s excuse that it is all a ruse by their detractors. There is one way to lay all these insidious rumours and accusations to rest. The Anti-Corruption Commission must set up an Inquiry to probe the financial assets of the President, his ministers and public officials before they leave office in 2007. Whatever assets are declared should be compared to what a minister earned in office to determine whether there was the wherewithal to accumulate those assets without recourse to pilfering the national treasury. Members of the public, who turn out to be the losers when a government feasts on their national economy , should also come out and provide information about suspicious material possessions belonging to members of the government. Any property found to have been acquired illegally must be confiscated and given to the state. This will warn members of the incoming government that if they engage in corruption, they will face the same fate. But a grave injustice will be done to the people of Sierra Leone if the “Borboh Bellehs” and thieves in the government are alloweed to leave office with all their illegal loot. This must not be. Let us prove to the international community that we care about transparency and accountability. 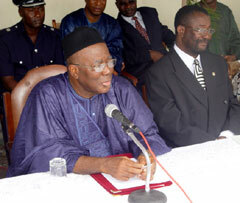 Kanbah and his ministers and officials should face a public inquiry before they leave office in 2007.